Mornings at my house are hectic and fast-paced. The minute I open my eyes, and hit snooze for the sixth time, I roll myself out of bed to start the process. Kids up, kids fed, kids dressed, lunches packed and off they go to school. The last thing I seem to have time for is making breakfast for myself. Some people are not big eaters in the morning, but for this busy mom I need some fuel to keep me going. Yesterday my family ate breakfast at a local chain restaurant after church. One item on the menu was called “Eggs in a Basket.” It consisted of an egg cooked in the middle of a piece of bread, then toasted. It sounded good-but I wanted to see if I could make it a bit healthier. I started off using some good olive oil in a small skillet. I let this heat up a bit on medium-high heat while I tore a couple of leaves of lacinato kale up into tiny pieces. Lacinato kale is not as bitter as traditional curly leaf kale, so I like to use this in my recipes. I let the leaves crisp up in the olive oil for a minute or two, threw a dash of salt and pepper on it and finished it with a sprinkle of red pepper flakes. Once the kale was crispy around the edges I pushed it to the sides of the skillet and then cracked one cage-free egg in the middle. You may need to add more olive oil, depending on how much you started off with and what the kale soaked up. I let the egg cook to “over medium,” with the whites fully done and the yellow slightly runny. Then I took the crispy kale and put it on top of my egg. That part of the recipe was finished! While my egg was cooking, I toasted a piece of brown rice bread. You can use any bread you like here. I chose brown rice because of my gluten intolerance. I used a small section of an avocado to spread on the bread like you would jelly. 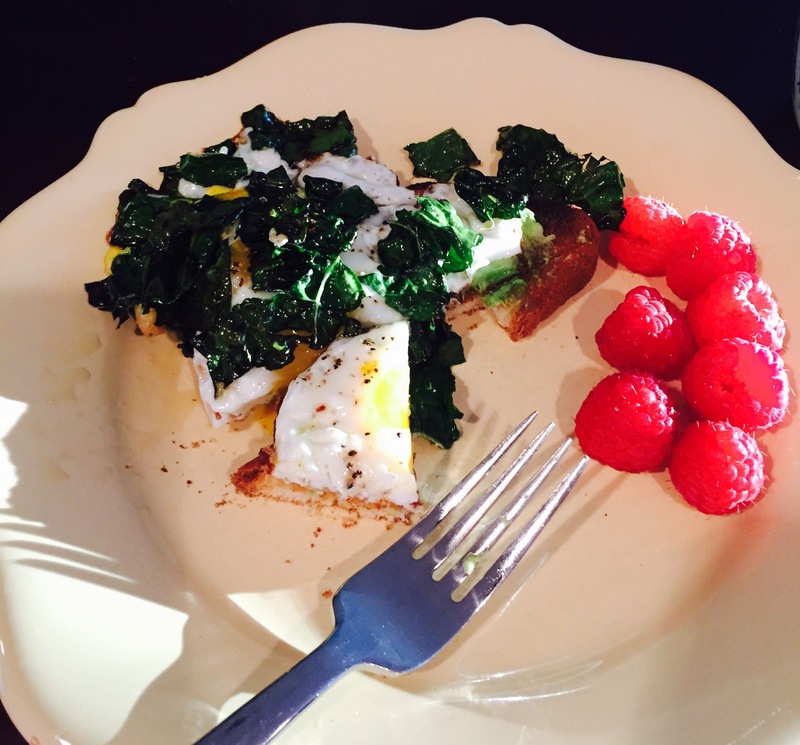 Then I placed my cooked egg/kale mixture on top and suddenly had a healthy breakfast cooked in under 10 minutes! It was a slightly different version of what I saw on the menu yesterday, but it was definitely just as delicious and a lot healthier! If you are a vegetarian, or have an egg intolerance, you could use some cubed tofu and crisp that up with the kale. It would make more of a “hash” than using an egg, but it would take the same amount of time and be just as yummy. However your morning may begin, taking time to fuel your body for a busy day is a definite priority. Not only will your tummy be satisfied, but your body will benefit too.